Jeremy enjoys dueling in-between working as a chemical analyst and campus building manager. Yu-Gi-Oh, also called Duel Monsters, has entertained players globally for years. Most cards are well-balanced, but there have always existed some incredibly powerful cards; these are classified as either Semi-Limited (only two copies allowed in a deck), Limited (one copy allowed), or Forbidden (zero copies). 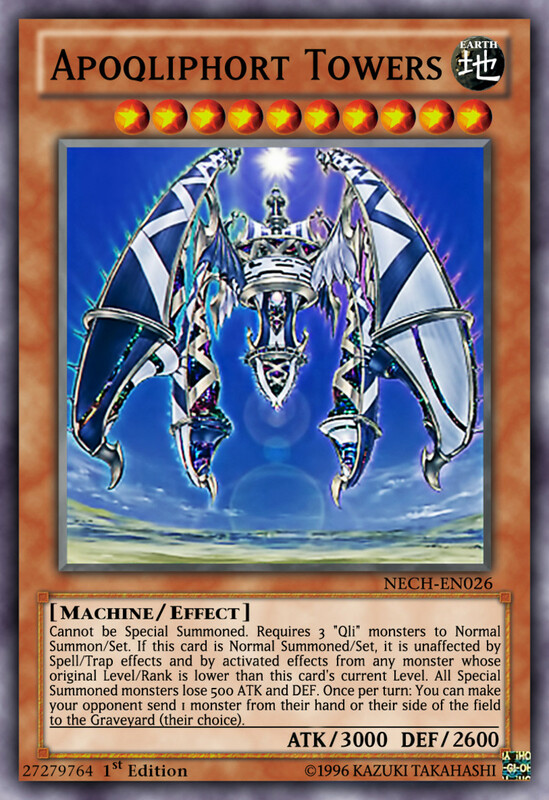 From the very beginnings of Yu-Gi-Oh, many magic cards (also called Spells) have demonstrated powers worthy of landing them on the banned list. 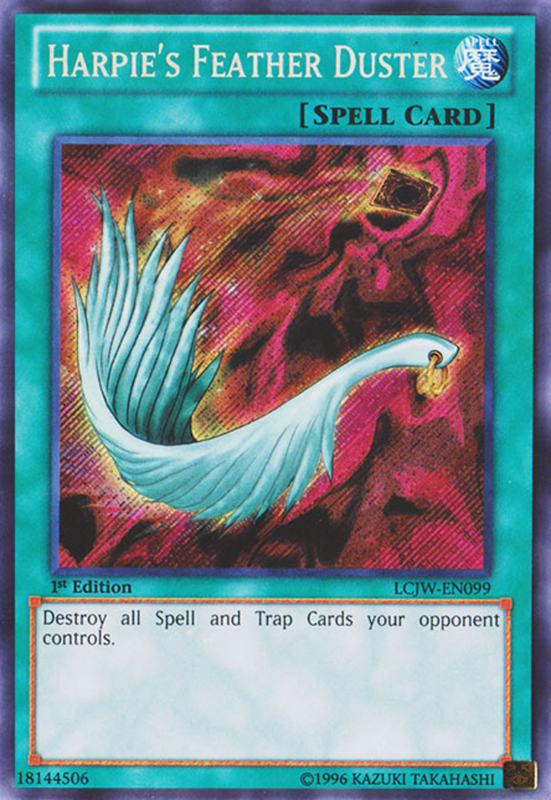 So without further ado, let's countdown the top six forbidden magic cards in Yu-Gi-Oh! Thus, the card lets you summon powerful creatures without reducing your hand. It also sends selected cards to your Graveyard, perfect for Graveyard-originating effects. However, note that the monster summoned perishes if Future Fusion gets destroyed, so your opponent has another chance to topple your behemoth. Still, the card shows way too much power to be tournament-legal. Update: While no longer banned, Future's errata delays its effect, something to bear in mind if you plan on using its tournament-legal version. This potent magic boasts of a simple yet potent effect: All opponent's monsters are destroyed. Simple as that. Raigeki shines above other destructive Spells since it affects multiple creatures and has no cost. For comparison, Tribute to the Doomed forces you to discard a card, Offerings to the Doomed makes you skip your next draw, and Soul Taker gives your opponent 1000 Life Points. And these cards all only eliminate a single target! 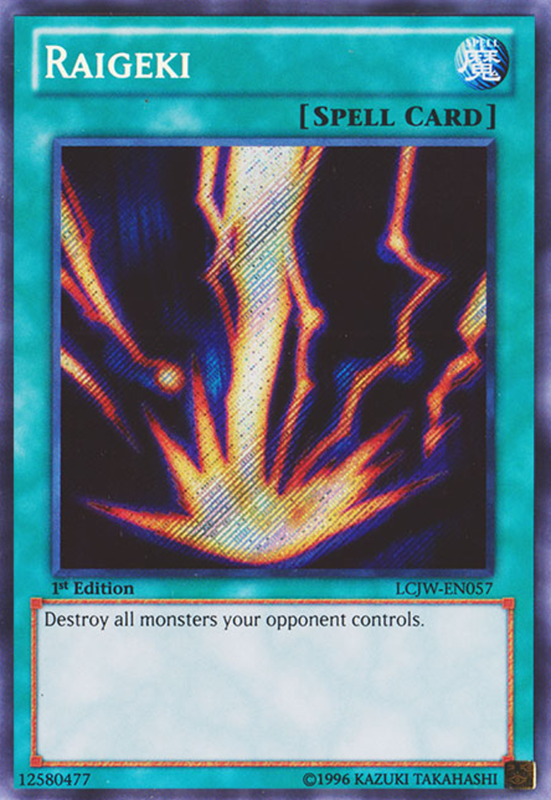 Now that summoning stronger monsters requires less effort than the early days of Yu-Gi-Oh (especially with Pendulum), the ability to take out all opposing monsters isn't quite as awesome as before, but one well-timed Raigeki can still decimate an opponent. Update: Raigeki's no longer forbidden, but limited, with only one copy allowed. It's not hard to see this card's benefits. It allows a player to summon a Monster from either player's Graveyard. And that's it. There's no cost, no disadvantage, no sacrifice. 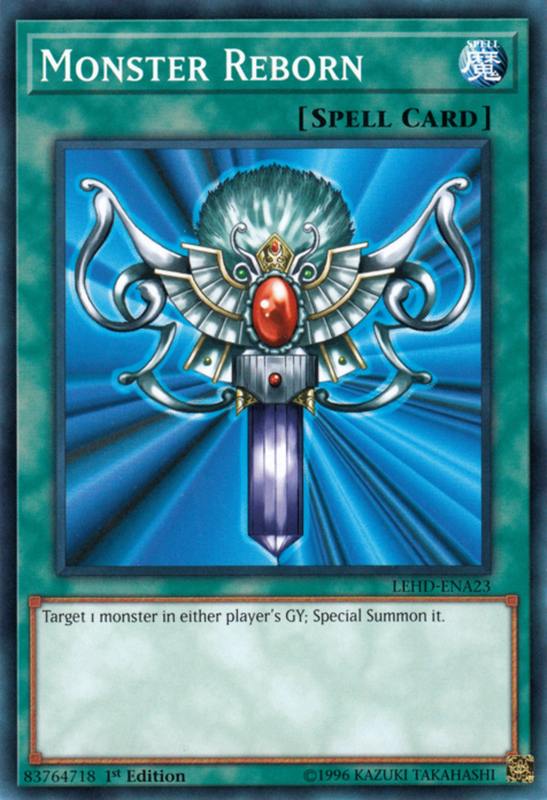 If your opponent spends time summoning a Monster that requires three monster sacrifices , but you destroy it, you could use this card to summon it again for free! All's fair in love and Yu-Gi-Oh. 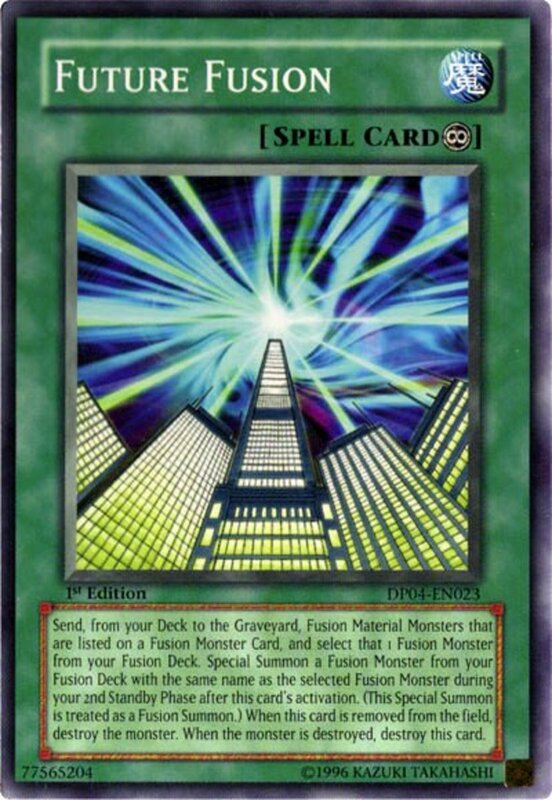 Just to show you how advantageous this card is, let's compare it to a similar magic, Premature Burial, which demands a player forfeit 800 Life Points, then they can summon a Monster only from their own Graveyard, and the magic equips to the Monster; if the spell is destroyed, the creature is too. Premature Burial costs Life Points, can only summon from one Graveyard, and adds a vulnerability to the Monster. Monster Reborn has none of these disadvantages, confining it indefinitely to casual play. Update: Reborn has been flirting with only being limited (one per deck); time will tell where it ultimately ends up. Think Raigeki but for Spells and Traps. Instant death, at no cost, to all your opponent's Magic/Trap cards. You can potentially eradicate seven cards for free (the five in the Magic/Trap zone, the Field Spell, and two Pendulum cards)! Yikes. 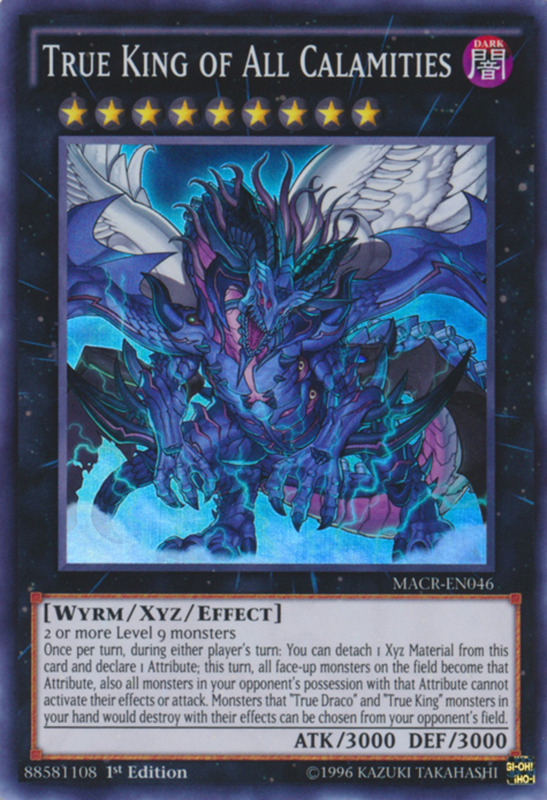 In tournament play, the (legal) Spell Mystical Space Typhoon works as a good substitute for Harpie's Feather Duster, though it can only destroy one magic or trap. Still, it's an instant-magic, so it can be activated during either player's turn. When I first started playing, I didn't understand just how strong this card is. Its effect is simple: Draw two cards from your Deck. Okay, so what's the big deal? 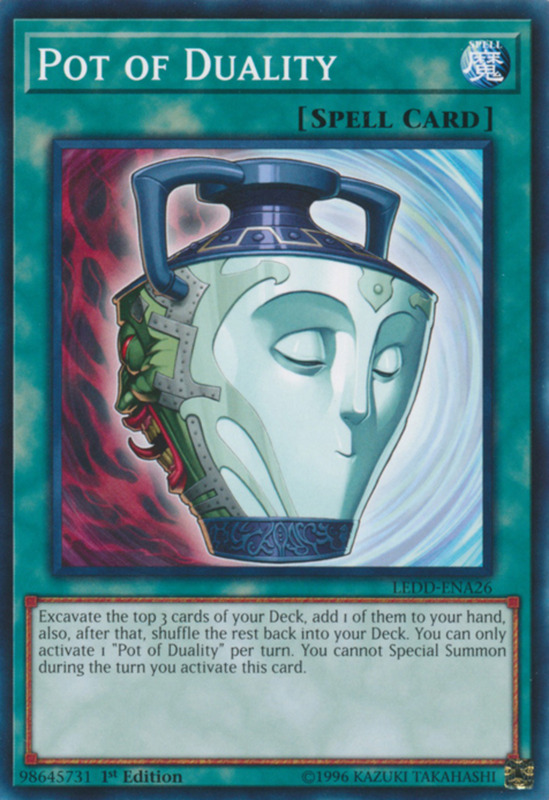 Well, Pot Of Greed is basically two for one. In Duel Monsters, players begin the clash with five cards in their hand, and at each of their turns, they draw one more from their deck. 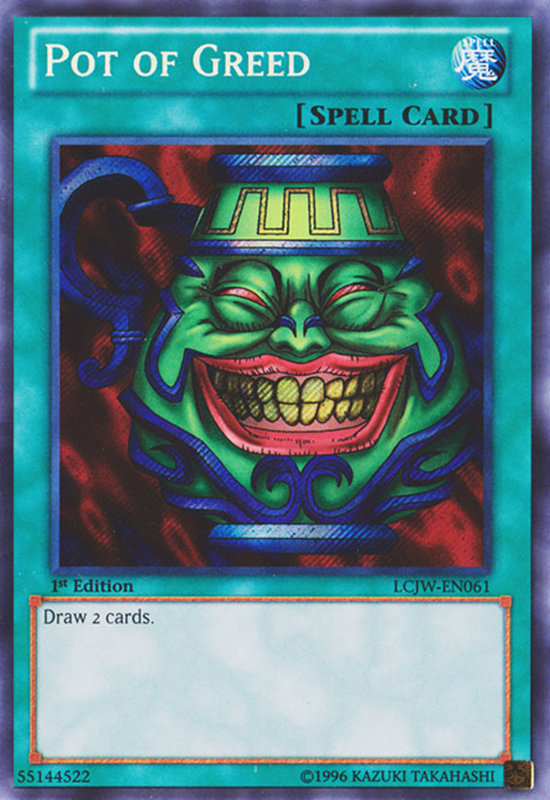 Pot of Greed essentially lets you skip ahead a turn by letting you spend one card (for no cost) to draw two. It may not sound like much, but that one extra could easily mean the difference between victory and defeat. Look at that sly smile; she knows she's banned and she's loving it. 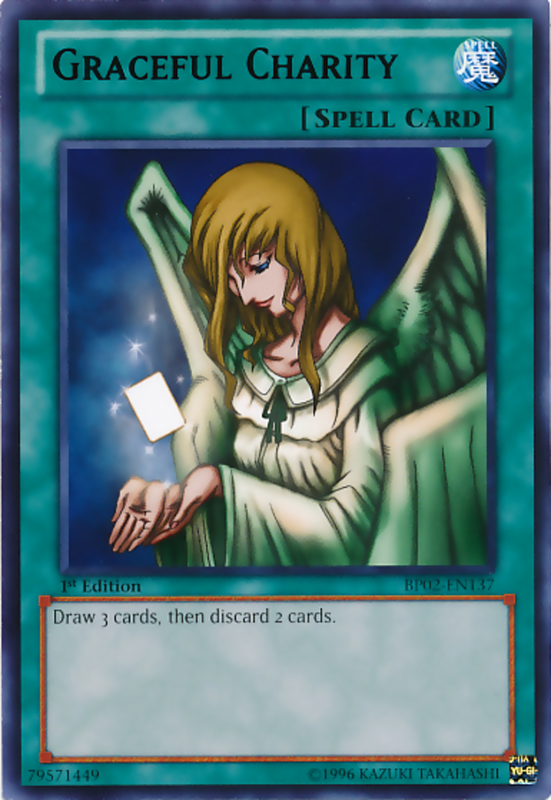 But in all seriousness, Graceful Charity allows a player to draw three cards from their deck, then select two currently in their hand, and discard them to the Graveyard. In any circumstance, this allows players to add to their hand, keep what they need, and get rid of what they don't, already an amazing effect. However, remember that some cards rely on others being in the Graveyard, or are even activated from the Graveyard itself. In ideal cases, Graceful Charity lets you replenish your hand, then set up more combos by discarding Graveyard-activated cards. Sifting through decks so rapidly while setting up Graveyard combos has long since chained this amazing card to the banned list. Which spell seems the most overpowered? Of all card types, I'd say the banned Spells are the most formidable, and I'm relieved we can ignore them in official Duels. Still, they're fun to play with in casual matches, and I look forward to seeing more overpowered cards released in the future. But for now, vote for your favorite card and I'll see you at our next Yu-Gi-Oh countdown! Shouldn't the Golden Castle of Stromberg be on the list of Yu-Gi-Oh's top forbidden magic cards? Nope. First of all, as of this writing, Golden Castle is only released in the Asian OCG, not the English TCG that most of us are familiar with. 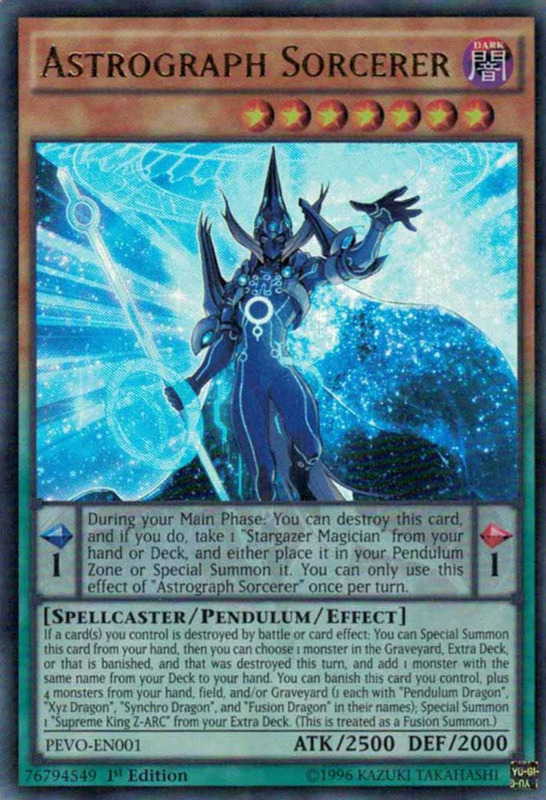 Second, it's not currently banned or even limited in the OCG. And most importantly, this countdown is several years old; I love me some Yu-Gi-Oh, but even I can't place cards that don't yet exist in my countdowns. Inferno Tempest can work well in decks that don't rely on monsters, but it's risky. If you have less than 3000 Life Points, it's worthless, and even if you do, you need your opponent to hit you with the damage at once; not enough monsters reach 3000 for this to be reliable. Finally, it doesn't take care of the monsters on your opponent's field, so you'll still have to deal with them. 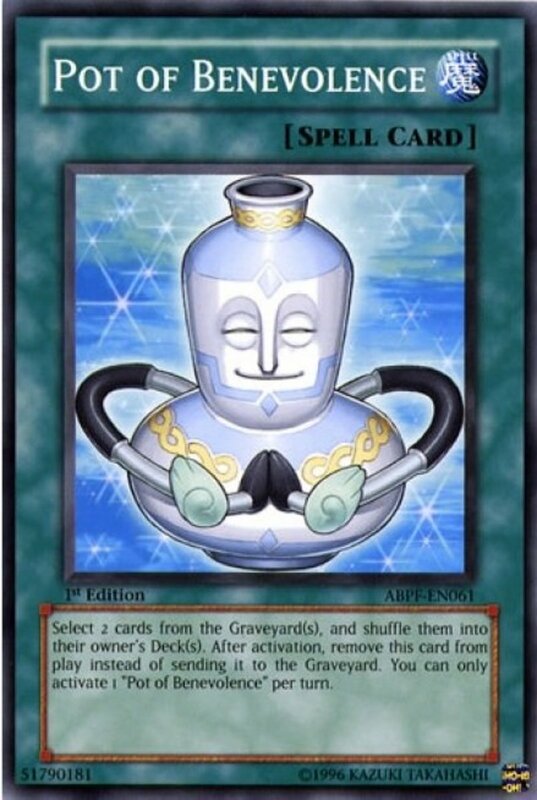 Pot of greed is the most op because of pure card advantage and no drawbacks to the card. Painful Choice is great, but at the time of this list's creation, I'd have easily rated these cards more useful for most decks. I would love to see pot back in play. heavy storm is another card that would go great with this list. Back in the day, Raigeki's all-powerful monster destruction was supreme, back when summoning stronger monster took far more effort. 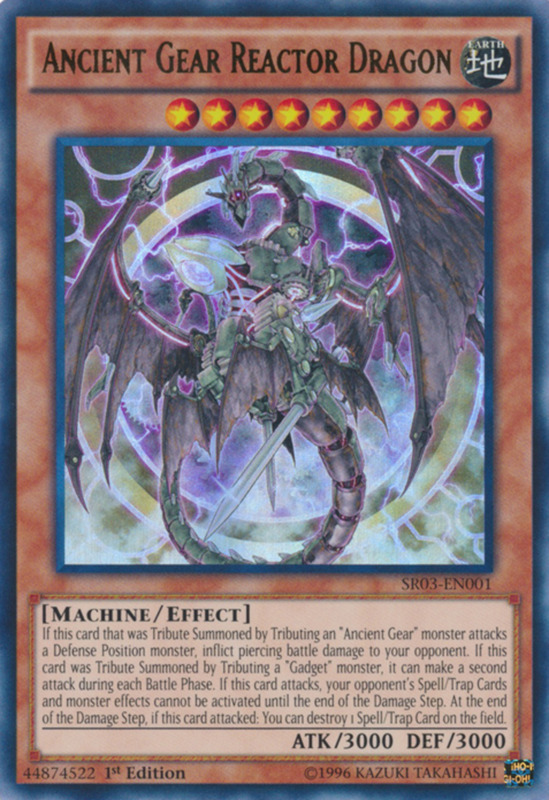 Nowadays, players can use one Raigeki since getting all their monster wiped out can be recovered from more easily. Still, it's an extremely powerful card.